Finesmith opens a new era of jewelry and accessories! Yula Finesmith dared something new for the idea of jewelry and accessories. The new “FlaSH” line that she created goes a very new and yet seen way. Usually if you have jewelry it is made to look most realistic. Yula Finesmith follows the possibilities you have in Second Life to attach prims where ever you like. In RL you need a piercer to have jewelry attached to your body like earrings or belly rings..not all parts of the body are made for such ;). In SL you can attach prims where ever you want and follow your creativity and ideas like you want… you just have to dare! This can be the great start or an amazing fashion trend… you just have to find out if you like it… I LOVE IT!!! First lets take a look at the new “Acupuncture” Set of Finesmith. You have no chains and no little wholes in your ears where the jewelry is connected to. Just long acupuncture needles that hold noble metal frames with amazing black gems in it! The needles just stick in the side of your head or the velvet flesh of your chest… the thought maybe painful but the look is awesome! The last set for today has the gret name “Deco Set” and it really means it 😉 A combination of copper and blue dominate this beautiful set. 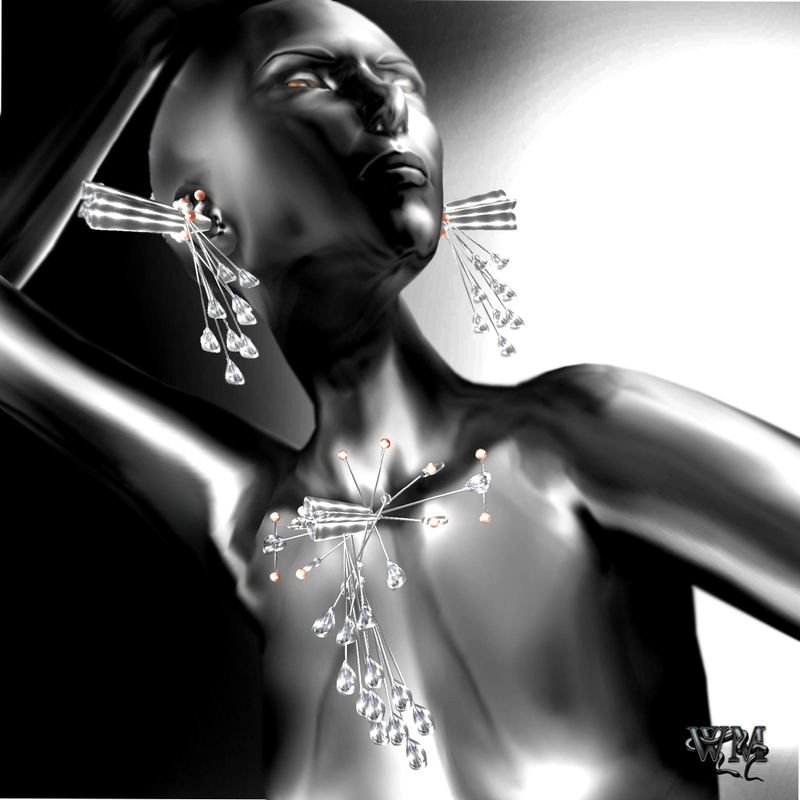 Technically in RL it would be very hard to realize as the earrings just pierced in the sie of the head and the fantastic necklace just was pinned into the cleavage. 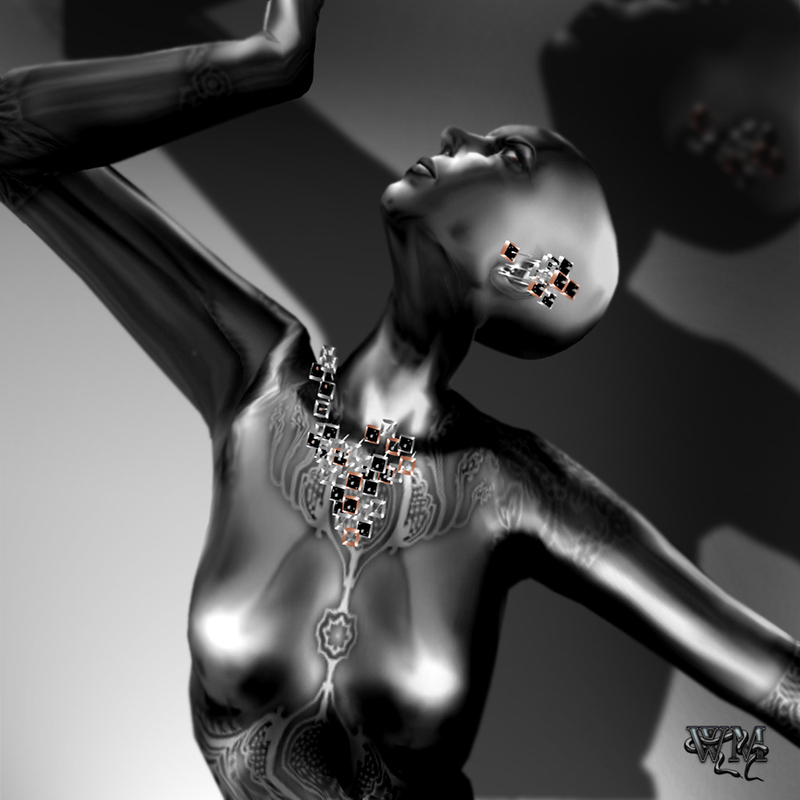 But SL gives us the possibility… ‘Fashion is Art’ I heard a lot of people saying and Yula Finesmith, genius designer of Finesmith made it come true. 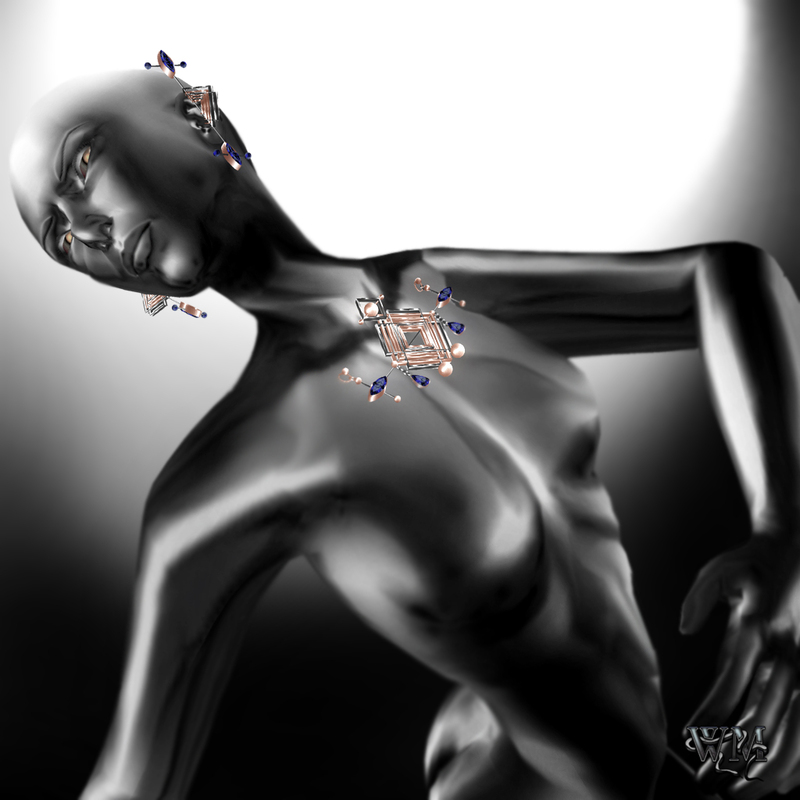 For me a new era of jewelry in SL. Thanks a lot for daring Yula! Star’s Gems – A new star on the jewellers heaven! The whole set is based on amazing filigree hearts made of noble metals. Gold and silver go perfect together and are decorated with sweet little diamonds. The hearts are hold by golden amazing detailed made chains. The basic set contains earrings and necklace and you also can purchase the matching bracelets. The necklace comes in 2 options to wear one for the chest and one for the spine attachment point. Seduction in purple…with the “Delilah- amethyst” set of Star’s Gems. An amazing mini set with earrings and a necklace. The necklace comes with 2 options to wear, one of the chest and one for the spine attachment point. Two little square amethyst textured stones are the basic for that amazing earrings and they are matched with little diamonds what gives them a very classy touch. The necklace is made of the same textured gemstones. They are in many different shapes and in between also the purple is broken by white diamonds and 2 bigger white circles at the bottom. A wonderful set that also can be worn for a casual outfit, not only as an addition to a formal gown or dress. Stargem Winkler again showed her fantastic skills and the love for the detail with this beautiful set! The first set of jewelry that I wear also in the picture above is the “Sementes” set made by Kunglers. The set is available in 3 different colors; silver/red, natura/gold and silver/wood. I rally liked the combination of noble metal and other textures that make this jewelry to a very variable accessorie. The pearls are framed by a very cute shaped mounting. This set is definitely an eye catcher! This beautiful flower jewelry set of Kunglers is named “Orquidea” A wonderful arrangement of flower looking gems and metals made with much love for the detail. This set definitely turns heads as it decorates the cleavage so wonderful. The earrings are made in the same shape and repeat the theme of the necklace perfectly. For this set you also have different options to choose for the colors. My last Kunglers jewelry set for today is the “Bambu” set. The necklace of this set not only decorates the cleavage it goes down and ends under the chest. It is not a single line necklace as you have more strings in a different length, carrying the wonderful ornaments and gems. The earring repeat the down end of the necklace.